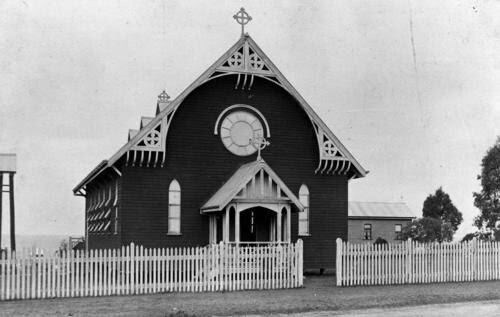 In the early years of the twentieth century, it was necessary for Catholic priests to travel from Brisbane down to Wynnum on Moreton Bay to conduct mass for the local congregation. There was no church there at the time, so mass was celebrated in the Wynnum Town Hall. In 1904, Archbishop Dunne, on one of his visits to Wynnum, came across a piece of land suitable for a church. He bought it for £420 as a gift for the Catholic parishioners of Wynnum. Richard Gailey was engaged to design the church, and it was opened in 1905 after construction by Mr J Little. The photo below shows the church in 1910. The church is on the other side of Bay Terrace to Mount Carmel Convent, which was designed by Hall & Dods and built a few years later. Is that the same side of the church or has it seen some modifications? The entrance looks bigger and side windows look to have been relocated and resized. There were some alterations made to the building in 2005.